The abundance, species composition, and distribution of amphipods were investigated in the Maryland Coastal Bays (MCBs) using macroinvertebrate and macroalgae samples collected monthly in 2012 with an epibenthic sled at 13 stations. A total of 34,779 amphipods belonging to 35 species were recorded, the most abundant of which was Dulichiella appendiculata that accounted for ~47% of the total number of amphipods collected. Deutella cf. incerta is recorded for the first time in the MCBs. The highest mean abundance of amphipods (34.8 ± 24.7SE ind m−2) and mean weight of macroalgae (12.91 ± 8.33 SE g ww m−2) were found in the northern bays, particularly in Isle of Wight, whereas the lowest mean abundance of amphipods (0.001 ± 0.001 SE ind m−2) and lowest mean weight of macroalgae (0.004 ± 0.002 SE g ww m−2) were found in southern bays especially in Newport and Chincoteague Bays, respectively. In the northern bays, Agardhiella sp. and Gracilaria sp. were the predominant macroalgae, whereas Ceramium sp. was the most abundant macroalgae in the southern bays. Positive correlations were observed between the abundances of amphipods and macroalgae, both spatially (rs = 0.93, p < 0.001) and temporally (rs = 0.82, p < 0.003), but not with other variables (temperature, salinity, dissolved oxygen, pH, water clarity). Dulichiella appendiculata was found primarily in association with Agardhiella sp. and Gracilaria sp., whereas the caprellids, Paracaprella tenuis and Caprella penantis were associated mainly with Ceramium sp. 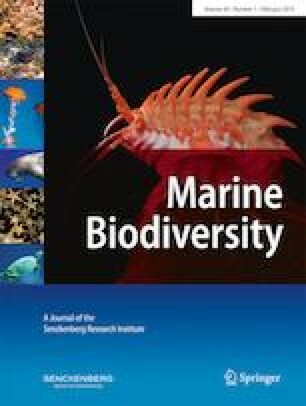 Macroalgae composition and abundance, therefore, seemed to influence the abundance, species composition and distribution of the amphipods. This research was supported by NSF CREST-CISCEP (Center of Research Excellence in Science and Technology-Center for the Integrated Study of Coastal Ecosystem Processes and Dynamics in the Mid-Atlantic Region) grant No. 1036586 and NOAA LMRCSC (Living Marine Resources Cooperative Science Center) grant No. NA11SEC4810002. We would like to thank Captain Christopher Daniels for his assistance in collecting the samples, as well as Wilmelie Marrero-Cruz for helping to create a map of the study area. Special thanks are due to Drs. Richard W. Heard and Sara E. LeCroy for their guidance and help with identifying amphipod species.